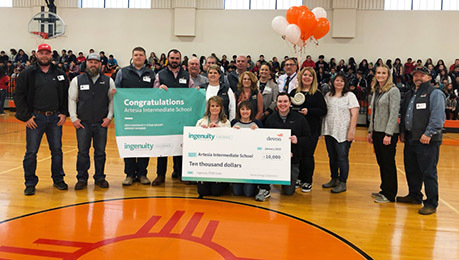 Devon Energy has awarded a $10,000 Ingenuity STEM Grant to Zia Intermediate School. Devon’s signature Ingenuity STEM Grant program recognizes schools for helping students excel in science and preparing them for college and future careers. The grant is intended to improve student engagement within Science, Technology, Engineering and Mathematics (STEM) concepts. Zia will use the grant for wireless sensors to explore natural resources and connect with their science curriculum. Students will engage in lessons that introduce them to natural phenomena and help build connections to their surroundings. Lessons include interactive field work such as conducting water testing from the Pecos River, allowing students to analyze local water quality and bring awareness to the importance of the area’s natural resources. Another lesson will involve conducting field tests on soil and rock strata in the area. Learning about local types of rock and soil will help students understand the geological history of the Delaware Basin and make connections to the natural resources in the area. Devon is one of many companies worldwide that rely on highly educated scientists to discover and develop new technologies and processes. The Devon Ingenuity STEM Grant (formerly Science Giants) was created by Devon Energy in 2010 to foster an interest in science among students across the country. As of 2019, Devon has awarded more than $1 million in STEM grants to schools in the U.S. This year, Devon plans to distribute at least $185,000 in grants to winning schools. Devon hopes the program will give schools the opportunity to create science studies that will engage students and prepare them for a career in STEM. Devon agrees STEM subjects are critical in preparing today’s students for college, the workforce and adult life, and its Ingenuity STEM Grant program is designed to reward teachers who are committed to finding exciting, hands-on and innovative ways to spark interest in these subjects. The Devon Ingenuity STEM Grant recognizes schools that demonstrate a commitment to using creative and exciting methods to foster student interest in STEM. These are all important subjects that students must master to be prepared for college, the workforce and adult life. It also plays an important role in the oil and natural gas industry as geologists, engineers and other petro-technical professions are vital to the industry’s ability to responsibly develop North America’s energy resources.